This strong link between the online and physical world lives beyond the holidays too, and store visits reporting in AdWords is helping advertisers understand it year round. In fact, in just under two years, advertisers globally have measured over 3 billion store visits. To get deeper insight into store visits performance, visit the AdWords Help Center and learn about two new distance and location reports coming soon that will help you understand where your store visits come from. 4. 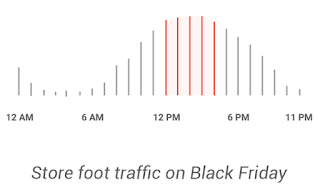 Google Data, Aggregated, anonymized store traffic for Electronics stores from a sample of U.S. users that have turned on Location History, November 2016. 5. Google Shopping Insights, U.S., all devices, Nov. 1 – Nov. 13, 2016. 6. Google Data, Aggregated, anonymized store traffic for Electronics stores from a sample of U.S. users that have turned on Location History, November 2016. With so much at stake, the AdWords app is the perfect way to stay in touch with your campaigns while still enjoying time away from the office. The AdWords app is available for download on Android and iOS. to help marketers show your apps to the iOS and Android customers that matter most, based on your specific business goals. Today, we’re announcing three new innovations to make your holiday app campaigns more engaging and effective. People love watching video, and with 1B+ users around the world1, YouTube is the place they go to watch. Now, advertisers using Universal App Campaigns can easily show their app in action using sight, sound, and motion with AutoDirector --- a new innovation that automatically creates immersive and engaging video ads. AutoDirector gathers your app's description and ratings, selects the best images of your app from the App Store or Google Play, and even picks the music to give your app a soundtrack. Our machine learning models work behind-the-scenes to figure out which version of those videos gets more people to install and engage with your app across YouTube and the 1M+ apps in the Google Display Network. Advertisers all over the world are using videos created through AutoDirector to help their dollars go further with Universal App Campaigns. 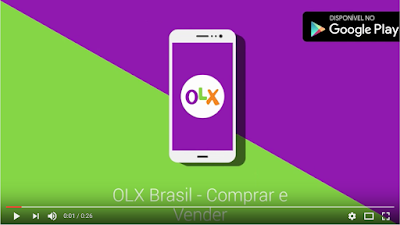 According to Caio Ferreira, Performance Marketing Manager, OLX Brazil: "The new AutoDirector videos helped the OLX performance marketing team deliver 78% more conversions through AdWords ... Amazing!" Learn more. People discover apps in a variety of ways, and nearly half of users find new apps while browsing on their phone’s app store2. Today, we are announcing a new ad placement in Google Play, exclusively for advertisers running Universal App Campaigns. As people browse apps in the Google Play Store, they may see ads in a carousel alongside other app recommendations. 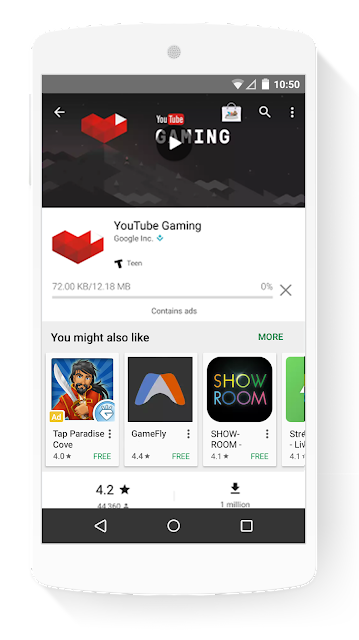 For example, we may suggest a new game like Tap Paradise Cove to users who install the YouTube Gaming app. We encourage advertisers to monitor their campaigns as there may be some natural changes in performance and delivery as we roll out these new placements. There’s no better place to be than front and center on Google Play when users are in the market for related apps. But finding customers who are likely to engage with your app past the install is far more complex. Now, there’s an easier way to find these customers that matter most. Android developers who use in-app billing can now count in-app purchases as conversions in AdWords without any technical integration. Then you can use Universal App Campaigns to automatically find more of these valuable users who are more likely to make an in-app purchase in the future. And it doesn’t end there. Android and iOS developers can define any in-app actions that matter -- from beating a level of Tap Paradise Cove, to subscribing to HBO Now, to viewing an available hotel room on trivago -- and find new users who are more likely to take those actions. 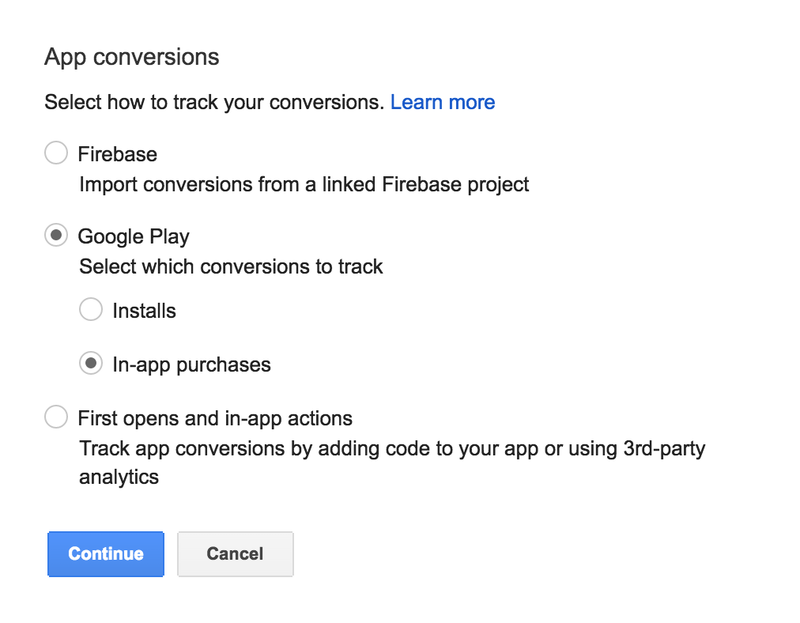 Advertisers can integrate in-app conversion data with AdWords through Firebase Analytics or other third-party measurement providers. There are 4M+ apps vying for users’ attention this holiday season. With these innovations, we hope Universal App Campaigns will make it easier for you to reach users that will install and engage with your app well into the new year. Please see our Official Guide to Finding Mobile App Users to learn more about getting started before the holidays. 2. Google/Ipsos, U.S., “How People Discover, Use, and Stay Engaged With Apps,” n=999, based on smartphone users aged 16-64, Sept. 2016. The holiday season is upon us, and millions of people around the world are looking forward to unwrapping their new devices and downloading their favorite apps. People have more choice in apps than ever before, making it critical for brands and developers to deliver useful and delightful experiences. We introduced the next generation of Universal App Campaigns to help marketers show your apps to the iOS and Android customers that matter most, based on your specific business goals. Today, we’re announcing three new innovations to make your holiday app campaigns more engaging and effective. This year, we see supershoppers continuing to turn to their phones for research and purchases. As we head into the one of the busiest shopping weeks of the year, Google data reveals how consumers will shop and what they'll buy. Though Black Friday weekend is the rare retail event that pulls even reluctant shoppers into stores, some areas of the country are more interested in deals than others. The way consumers shop and behave during the holiday season is rapidly changing, from the way they create their gift lists to the way they purchase. Shoppers are proving that both with their fingertips and their feet. 1. Google Search Data, Nov. 2014 vs. Nov. 2015, U.S.
3. Google Analytics, aggregated, anonymized data from U.S. accounts that are opted into sharing benchmark data; mobile only, shopping vertical, Nov. 15, 2015 - Dec. 31, 2015. 4. 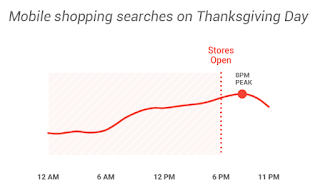 Google Shopping Insights, U.S., all devices, Nov. 1 - Nov. 13, 2016. 5. Google Search Data, U.S., apparel, home & garden, beauty & personal care, computers & electronics, gifts, toys & games, photo & video, Nov.–Dec. 2014 vs. Nov.–Dec. 2015. 6. Google Data, Aggregated, anonymized store traffic for clothing, electronics, and toy stores from a sample of U.S. users that have turned on Location History, Nov. 2015. 7. Google Search Data, U.S., apparel, computer & electronics, and games & toys. mobile only. Nov. 2015. 8. 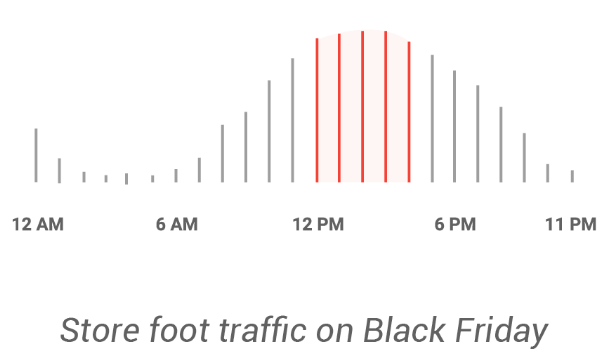 Google Data, Aggregated anonymized store traffic for clothing, electronics, and toy stores from a sample of U.S. users that have turned on Location History; Store traffic after midnight attributed to Black Friday, Nov. 2015. 9. Google Search Data, U.S., apparel, home & garden, beauty & personal care, computers & electronics, gifts, toys & games, photo & video; mobile only. Nov. 2015, U.S.
10. Google Data, Aggregated, anonymized store traffic for Clothing, Electronics and Toy stores from a sample of U.S. users that have turned on Location History; Google Search Data, U.S., Apparel, Computer & Electronics and Games & Toys; Stores considered open after 6 P.M. on Thanksgiving, November 2015. Smartphones have become consumers’ trusted shopping companions. Mobile shopping searches surged in 2015, passing desktop for the first time on Thanksgiving and Black Friday.1 This year, we see supershoppers continuing to turn to their phones for research and purchases. During the holidays, shoppers look to their inboxes to get updates from their favorite brands. Now you can be there with beautiful catalog experiences that wow them. When people click on your Gmail ad, it expands to show up to four rich images or videos, with descriptions. For example, a beauty brand can show customers Black Friday deals on eyeshadow trios and matching eyeliner. These ads automatically adapt to any device, so people can scroll through your beautiful imagery wherever and whenever they’re using Gmail. It’s easier than ever to keep your ads in tune with the season. We recently introduced responsive ads, which help you reach more people because they adapt to fit millions of websites and apps on the Google Display Network (GDN). Responsive ads also give you the flexibility to customize your message for the holidays -- without doing heavy lifting. Simply provide holiday-themed headlines, a description, an image, and your URL -- and Google automatically designs beautiful responsive ads that can run across the GDN. That means it’s a snap to add holiday promotions and seasonal products to your campaigns. iZettle, a payment technology company, used responsive ads and drove a 2x increase in conversion rate compared to text ads. When people know where to find you this holiday season, they’re more likely to stop by your business. 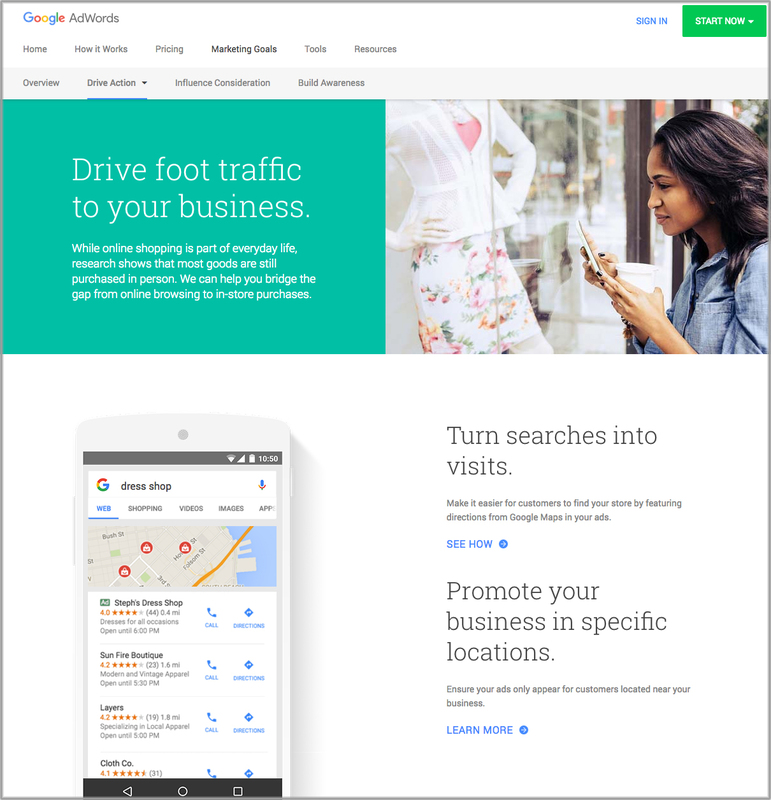 Location extensions for display lets you highlight your address, Google Maps directions, and photos in your ad so you can turn online clicks into foot traffic to your store. The Home Depot used location extensions for display to reach consumers actively browsing their phones near the brand’s most popular stores, driving an 8X in-store ROI. It’s the most important time of the year for many businesses. Delivering the right message can mean the difference between customers choosing your business -- or another one. Whether you’re trying to drive sales on your website or bring people into your stores, we hope these innovations will help you tell your story and win more customers this holiday season. 1. Google/Ipsos, "Post-Holiday Shopping Intentions Study—Total Shoppers Report," base: used smartphone for holiday shopping, n=410, Jan. 2016.
new AdWords website that puts your goals front and center, and shows you which ads work best to accomplish those goals. You can also use this site to find info on our latest ad innovations, success stories from other marketers and best practices guides. For example, if you’re a multi-channel retailer driving foot traffic into your store, learn about Google solutions like ads with store directions that can help people find your nearest business location. Or if you just launched a new app and want to make sure the right people discover it, you can find best practices to get more high-value users to engage with your app. You can also draw inspiration from businesses like GrubHub that ran ads to connect with customers the moment they're searching for new apps in the Google Play store. Check back in on the site regularly as we'll continue to add content. Also, help us ensure that the site is as useful as possible by sharing your feedback. We look forward to hearing your ideas and suggestions. As marketers, you’re always looking for more effective ways to achieve business goals - from getting customers to discover your brand to encouraging them to buy something from your site, and everything in between. Today, we are introducing a new AdWords website that puts your goals front and center, and shows you which ads work best to accomplish those goals. You can also use this site to find info on our latest ad innovations, success stories from other marketers and best practices guides.